Silly Cheeks is the premiere entertainment company in NYC and NJ. We provide professional face painting, body painting, glitter tattoos and balloon twisting for all ages! Available for private, public, corporate events and any other event that can use some Silly Cheeks! We have serviced companies like McDonalds, Ferrari, Nickelodeon, Queens Botanical Garden, Mets, Samsung, CVS, YMCA, Wells Fargo and many many more! We hired Perla for our corporate cruise party. She and her team were absolutely outstanding! Once aboard the boat, they worked non-stop with face painting as well as balloon twisting for children and adults. Perla is very professional and very responsive. Definitely would hire her and her team for all future events! Their work were fantastic and amazing! Highly recommend for all personal/corporate events! The most talented face painter I have ever seen!!! I first saw Stacy at a Ferrari race event back in July. I didn't even know she was there face and body painting until I noticed people around me sporting the Ferrari logo (prancing stallion) on their arms. They were so well painted I thought someone was painting them with a stencil. When I finally managed to get through the crowd that was surrounding her table, I saw that she was painting them free hand! I was amazed by her talent and decided I must get in line and get one myself. She painted the logo on me in less than 5 minutes! I was totally blown away by her talent, that decided I had to book her for my daughter's 5th birthday party. At my daughter's party she impressed me even more. Not only was her face painting beautiful and delicate, her balloons were the cutest balloons I have ever seen! Stacy is truly a gifted artist and on top of it all she is a sweetheart. The other parents thought I was a genius for booking her! Will be using her for all of my future parties, I can't wait. Thank you again Stacy! You are welcome Emily! Thank you again for having me at Emma's birthday party, it was a great party!! This was my second time using silly cheeks for my children’s parties and my expectations were surpassed again!! Perla does the most amazing job, keeps the kids occupied and enagaged. Her face painting is detailed and quick. Everyone gets a turn and looks spectacular. She also does balloon animals and glitter tattoos. We love her and plan on using her for all our future parties. I recommend them to everyone as I haven’t seen a face painter better! It was a pleasure servicing your son's Christening party and thank you again for having Silly Cheeks Face Painting. We can't wait for your next party! Last year, at a friend's birthday party I was impressed at the talent of the make up artist from Silly Cheeks. I knew I needed to book them for my daughter's first birthday. Perla was our artist. She was prompt, set up in a timely manner and worked her magic! The kids had a blast with her and they looked awesome! Perla was extremely talented and patient with the excited kids. Some of the adults were so impressed with her work, they got in on the action too! I highly recommend using Silly Cheeks for your next function. I can't wait to have another party so I can use them again! We've worked with Perla and her artists two years in a row. For our last party, just about every single child - including the boys! - got their face painted in some way. She has beautiful options for girls, and many for the boys - from small designs to full face. She was busy the entire two hours of our party, and got every child done that wanted something (and about 5 of the adults - including me - too!). I'm excited to have her again in June. Reasonable rates, and professional approach. Highly recommend. Silly Cheeks Made My Daughter's Day!! Thank You Silly Cheeks for making my daughter's second birthday so special. Perla was wonderful with all the children at the party from ages 2 - 10. Our guests raved about how talented she was. Perla made my 2 year old daughter and 20 month old niece feel so comfortable that even they had their faces painted. The Balloon Twisting was amazing it made my daughter's face light up when she saw the Elmo Perla made for her. i would definitely recommend Silly Cheeks for your event. I almost never post a review but I felt that I had to tell other parents how glad I am to have hired Silly Cheeks for my son's first birthday party. Our artist Stacy was awesome, she did everything the kids asked for and even entertained some of the adults. Everyone was really excited about the balloons and the face painting. I would definitely hire them again! Perla and Stacy are AMAZING! 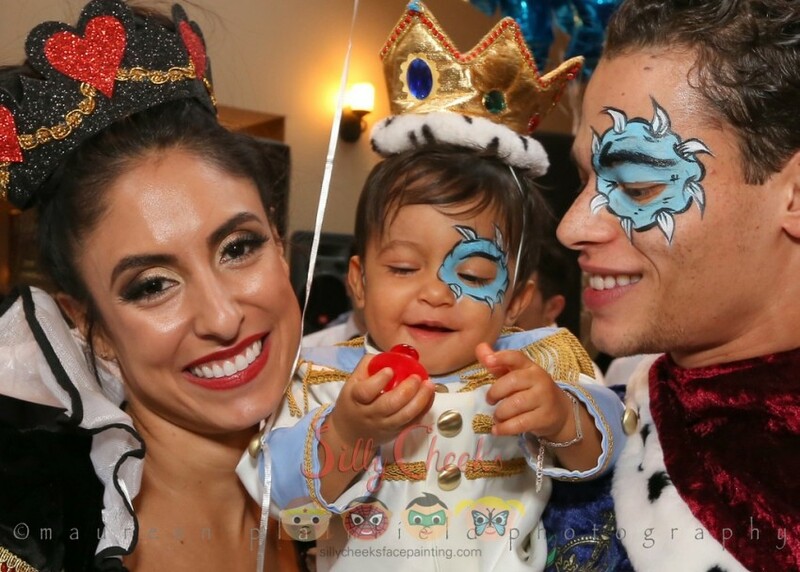 I've had the pleasure of working and seeing Perla and Stacy at many parties before so I was excited to have Perla add pizazz and fun to my son's first birthday with her amazing face painting and balloon twisting. Seriously? AMAZING. This one word truly encompasses her passion and abilities. There were so many kids at the party and every single one along with their parents were in awe of her skilled artistry, quickness and friendliness! she worked straight during the whole party with no complaint, and my guests were demanding! I love silly cheeks and can't wait to host another party to have them come again! Hire them, you will NOT be disappointed! The best thing is they're available in nj and ny. Love them! Perla did amazing job. I love her eprformance. All kids loved face painting and ballon thing. Even their parent liked it too. I definitely recommend perla when everybody has party especially for kids. Great. I had nothing but good things to say. Maria did a fantastic job. She not only painted kids faces/hands but also took interest in their lives. Kids loved her and adults could wait to have their turn. Balloons were also amazing. Not your simple basic styles but Elmo's, swords, flowers and giraffes. I know I will be using silly cheeks again and so will other parents from our party. Thanks! I am so glad to have found and booked Silly Cheeks for my daughter's birthday party. Perla was on time and ready to go as scheduled. She was sweet, personable, and very artistic! Everyone at the party was impressed with her work, and I want to throw another party just to book her again!! After a lot of deliberation, we chose Silly Cheeks for Face Painting at my 6 y/o daughter's birthday. Perla did a magnificent job. She was on time, professional and extremely talented. She did not spend a minute more than the allocated time, as she had another party thereafter. But while she was with with us, she gave it her all. All the children were ecstatic as was I. The photos online live up to her reputation. I wouldn't hesitate in using their service. Thumbs up!!! Thank you for making my daughter's birthday a dream! We hired Perla to do face painting and balloon twisting for our daughter's 3 year birthday with about 13 children for 2 hours. She responded to e-mails quickly. She arrived early to set up and had painted my daughter's face before the guests showed up. We informed Perla of the party's theme, and she showed up in a theme shirt. She was friendly and professional the entire time. Her face painting was top notch - not just some flowers or hearts! We would definitely recommend her! Found Silly Cheeks through a friend's referral. Perla came to my son's first birthday party and wowed our guests with her face painting and balloon twisting skills. Our initial phone conversation was a bit underwhelming, but it was probably attributable to the bad phone connection. The day of, Perla showed up early, was professional, courteous, efficient and simply a pleasure! I was running around that morning, totally overwhelmed and pulled in different directions... but Perla set up shop, did her thing and I didn't have to worry about a thing. Children would just emerge after sitting with her with wonderful creations painted on their faces, hands or arms. I had several parents come and tell me how great she was. How she was super efficient and was able to manage the line of children better than they had seen at other events, etc. You get the idea. She was great! And I wouldn't hesitate to recommend her or hire her again for the next event. Highly recommend! I had Silly Cheeks at my sons baptism and it was a hit! People came up to me the whole time asking where I found her. 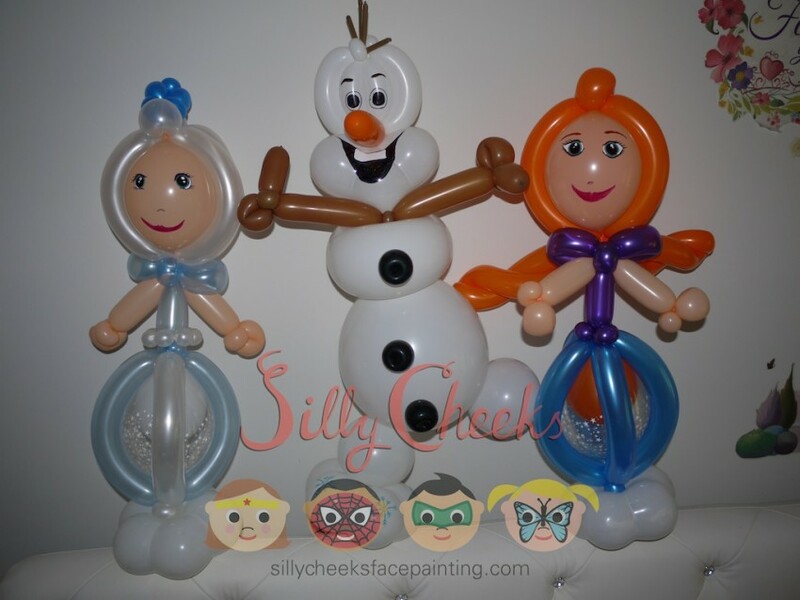 She's not your ordinary fast painter/balloon sculpter. She truely has an artistic flare and I would definitely use her again. Also great for all ages. Thank tou again :) The Andruzzi Family. Thank you Stacey for adding your amazing talent to our party. The kids LOVED the face painting and balloon twisting. Your creativity is unmatched! Thank you again. i hired silly cheeks for my twins birthday party ,and I am so satisfied with they're service. Perla is the girls name .she is so talented un artists. All my guests were amazed from her service.i highly recommend silly cheeks. I recommend it to all my friends. I highly recommend Silly Cheeks for any child event. Stacy is a great artist and very patient with the children. Everyone at my daughter's birthday kept commenting on how great she was! This is by far the best thing I spent money on for my daughters first birthday. They are patient with all the kids (and some adults that want to be kids). The artist is just that, an artist. Everything she created was beautiful and she provided adorable headbands and bling for all the girls. everyone raved on how great the quality of the work is but overall is was her demeanor with the children. We hired Silly Cheeks for our son's first birthday party. The entertainment provided was equally fun for the kids and the adult guests. Not only talented but both Shelley (caricaturist) and Lena (face painter/balloonist) were patient, thoughtful, and friendly throughout the whole time. It was a small event space but they worked with what they got and all the art works came out amazing. The company was very professional and friendly from the beginning to the end. They gave thorough explanations on the process, were responsive on all my emails, and even followed up post party to make sure everything went okay! Highly recommend. We've used Silly Cheeks twice now for our daughter's 1st and 2nd birthday parties. Both times they've been a pleasure to work with. On time, professional, extremely friendly with guests, and the work is great as well. Have recommended Silly Cheeks to a bunch of our friends as well. Couldn't be happier! Contracted Silly Cheeks for my granddaughter's 2nd birthday party. Our artist was Gina! I can't say enough good things about her. The kids were so happy. I was so pleased that I started handing out her business cards! Thank you for a job well done! See you at our next party! Perla did such an amazing job with the face painting and balloon twisting for my daughter's 1st birthday party. I can't count the amount of friends and family that approached me to tell me what a wonderful job she did. I, myself, was so impressed with the quality of her work and how fast she was able to do both the face painting and balloon twisting. I am so happy to have found Silly Cheeks, and will certainly turn to them for any future events/parties that I have! We had silly cheeks for my son's first birthday. I had a wide range of kids ranging from 12 yrs old to 1. Everyone enjoyed the services provided. From the detailed beautiful face painting to the glitter tattoos to balloon twisting. There was something for everyone. The face painting was amazing, there was a great selection to choose from and all the kids loved it. The detail and colors of the face painting was awesome. You could tell Perla is extremely talented!!!! Thank you silly cheeks!!! Had a private party for my sons first birthday at a small restaurant and all my guests were amazed by lenas work! She was extremely professional and did an amazing job. She took her time with each child and even the adults did some creative art as well. Her balloon art was very nice as well and I would definitely get her again for my next party! Thanks so much for making my sons birthday a success! I just booked Silly Cheeks for my son's 4th birthday and they did a great job. I booked them at the last minute (the day before) and still they responded right away, made the process easy, showed up on time and painted the cutest designs on the kids. They also did balloon twisting for us. The kids loved it! I would and will definitely book them again. I had Perla at my daughter's first birthday party for face painting and balloon twisting. She was awesome!!! Designs and colors were awesome. It was nothing I would have imagined, simple colors and designs. She was very patient with the kids and professional. I would definitely use her again in the future. I could not thank her enough. Perla is THE BEST!!! Perla and friends at Silly Cheeks did amazing, artistic work at our recent event! Four of their artists did over 200 beautiful faces in just 3 hrs, and we loved the results! Thank you for your incredible work, we will definitely hire Silly Cheeks again! Super Talented + Great Service - Highly Recommend! Stacy and Perla did face painting and balloon twisting for a large corporate event that we hosted on Thanksgiving day, and they were a huge hit! Everyone was super impressed with their work - the adults as much so as the kids. Stacy was also extremely responsive to all of my emails and very reliable - there were a lot of logistical hoops associated with this particular event and she tended to all of them with a great attitude. I'd recommend Silly Cheeks to anyone! Everyone was so impressed with the quality of face painting from Silly cheeks. She was patient and able to paint so many faces over 5 hours with out a break. I don't know how she did it. Great job. All of our students asked me for their contact information. Stacy was so great with the guests at my son's first birthday party. They absolutely loved her and couldn't stop talking about how great she is at what she does. Even the venue asked for her business cards! I would highly recommend her to anyone for their next event. We had Karen come and do face painting, balloon animals and it was great. She was extremely punctual and did a great job with the kids. I have hired Perla for 3 of my Events! She has Fabulous face painting and balloon making skills! The kids love her face painting and balloons. All of my up coming events Perla will be the 1st. Person I will Call. Couldn't have asked for more for my daughters first birthday! Stacy was a true professional who keep high energy guests engaged and satisfied. The level of artistry in face painting was unbelievable. Adults and children were impressed! Balloon twisting was an added bonus that provided additional entertainment for the children...and adults! Guests and hosts look forward to working with Silly Cheeks again soon! The services were worth every penny!! Perla did a Halloween face painting event for us and she was amazing! All the parents were so impressed with her work and the kids were so excited! She was so professional and friendly. She was great with the children and was happy to accommodate any of their requests. We would definitely love to have Perla come back again. Perla from SILLY CHEEKS is a supremely talented artist who created beautiful designs for hundreds of kids at our annual fund raiser, The New York City Congenital Heart Walk. MORE IMPORTANTLY, the kids adored her - they lined up to get their faces painted and Perla never turned down a request. Our kids were transformed and brought a huge level of joy to our day. Perla did an outstanding job for us, painting beautiful designs for not one but two back to back parties! She was extremely professional, arrived well before the event was set to begin, has quality materials and was sensitive to some of our smaller guests initial fears about getting their little faces or hands painted. We are thrilled that we had clients book her right on the spot for future events. A+ vendor - Thank you! I booked silly cheeks really late because I initially wasn't planning anything for my daughter's bday but luckily they were available. Perla was a pleasure to deal with, so professional & sweet. Our artist, Lena, was great! The kids were so happy and their parents kept saying how great the face painting turned out. We hired Perla for our corporate event and she did an unbelievable job! We were all blown away by her work and the kids absolutely loved her. We would absolutely hire her again for another event! My experience with Silly Cheeks was wonderful. I had to postpone our yearly building party due to rain and the previous face painter could not make it. I called Silly Cheeks the day before my event and Perla could not be more accommodating, sweet, and professional. She was able to talk to me even though I literally called her on her way out the door to another event! She was very patient with all my questions. On the day of the event the face painter Karen was wonderful; her art work was really special. All in attendance commented on her wonderful designs and the kids where very happy as well. Silly Cheeks was truly a lucky find for me! SO Much Fun to Work with Silly Cheeks! We held a company picnic event in Central Park recently and hired Silly Cheeks for Face Painting and Balloon Art. WOW, they were amazing! Our Face Painter and Balloon Artist was Lena and she was a doll!! Stacy (the owner) is incredible to work with. Her customer service, friendly demeanor and overall good nature are apparent from the first communication with her! We will definitely be using Silly Cheeks again!!!!! Silly Cheeks Face Painting provided great entertainment for our 'Bring Your Kids To Work Day Event!' Although my inquiry was short-notice, confirmation of availability was confirmed quickly and payment was seamless. Thank You :-)! I booked Silly Cheeks for my sons first birthday party. My artist Lena arrived on time and set up quickly. She was very professional and courteous. Lena met all of the children's(and adults) requests for both the face painting and balloon tying. She even made a little Elmo balloon for my son. Lena even stayed a few extra mminutes for the last minute requests. I will definitely book Silly Cheeks Face Painting for any future events. Terrific face painter and ballon artist! I used silly cheeks to entertain the kids at my daughter's birthday party. The rates were reasonable and Stacy did outstanding work with face painting, tattoo's, and balloon art. My friends and their kids had a lot of fun and were impressed with her skills. I highly recommend them for parents looking for a face painter. Perla did face painting and balloon animals at my son's fourth birthday party today and I cannot emphasize enough how impressed I was!! Her face painting is truly beautiful and you can see how much care she puts into everything she does. She is truly an artist. The kids at my son's party were magnetically drawn to her---she is such a sweet person and she is wonderful with kids. My son refused to get his face painted so Perla told him she would do whatever kind of balloon animal he wanted. She made him the cutest and cleverist T-Rex! It was adorable! These are not your average balloon animals! Her work brings balloon animals to a whole new level. For the girls, Perla did balloon princesses. I am so glad that we lucked out and hired Perla--she made our party so special and fun, and everyone loved her work. Thank you Perla!!! my wife put me in charge of the kids' entertainment for my third child's first birthday party which was held at Pier 701 (recommend!). I forgot to do anything until the week of the event. Thankfully, Perla had a slot open. She brought a helper for the balloons and her face painting was a hit with all the kids. She made some tiger looking faces, ponies with a jewel on the arm, dinosaurus, and other stuff. I think I even saw some adults with the facepaint. Price for the service was great. Perla's not only a face painter, she's actually an artist. I can appreciate her skills. We've had Stacy at our sons party for the last two years. Her face painting, balloon twisting and glitter tattoos were the star of show for the kids. Her designs are really awesome and way beyond what you typically expects. The grown-ups were fighting their way through the line too. Will definitely have her again. Perla was awesome! On time, friendly and reasonable in price. She is very talented and was great with the kids! I defintely recommend her! The kids at our party enjoyed the face painting and balloon twisting. I combined this with our own pinatas and this was a great recipe for fun for kids of varying ages. Perla, I apologize for that late review. I am one month late. Sorry, I've had my hands tied with three kids and a dog. But here is my review. I am so happy I hired Perla. She is the best face painter and balloon twister I've ever seen in my life. I threw a 100 day celebration of my daughter Sophia's birth. I was contemplating at first if I should hire entertainment for the kids that were going to attend Sophia's party. But I am so happy that I did and I hired Perla. Perla was absolutely the hit of Sophia's party. Perla and Sophia were like rock stars throughout the night. All of the kids and the parents loved Perla. Perla was amazing at both face painting and balloon twisting. She was extremely friendly and warm and loving with both the kids and adults. There were no complaints and all of my friends and family kept asking where I found Perla. They all took her business card. Perla was able to paint anything the kids wanted and also twisted all different kinds of things from the balloons including an Elmo, a barbie doll, and even simple things like swords. Perla even did headbands with balloons on them. I was extremely impressed and so was everyone at the party. I am so happy Perla was a part of daughter's 100 day celebration and I intend on having her at as many of my three kids future events as possible. Thanks Perla. Sophia says thank you too. Stacy is an amazing face painter and was able to paint almost anythig the kids wanted. We had a Mickey Mouse themed birthday party for my 3 year old and she and her 50 some guests loved Stacy. She also made cute little Mickey and Minnie balloon ears for the kids to wear and the other balloons she made were great and many kids took them home as parting gifts. I would highly recommend stacy to anyone looking for some entertainment at their party. This is the best face painting and balloon twisting that I have ever seen! My guests were so impressed! Perla is worth every penny!!! Perla did a spectacular job at my son's 1st bday party! All of my guests couldn't stop talking about how great she is as an artist and to their kids! One of my friend's son popped his balloon after my contracted time was up. She was so sweet and made him a new one with out us requesting. We'll get her again in our future events. You can never go wrong with her! All of the guests were very impressed with Jesse's talent in face painting and the balloons! The parents loved having their children's faces painted; even some of the adults were showing off their painted faces and arms! Jesse and her assistant were both very professional and "kid-friendly". We loved have Silly Cheeks at our daughter's first birthday party, and would highly recommend them for future events. Thank you, SillyCheeks! We hired Silly Cheeks for my daughter's 4th birthday celebration. The artist arrived early to set up. Everyone got at least one awesome glitter tattoo. 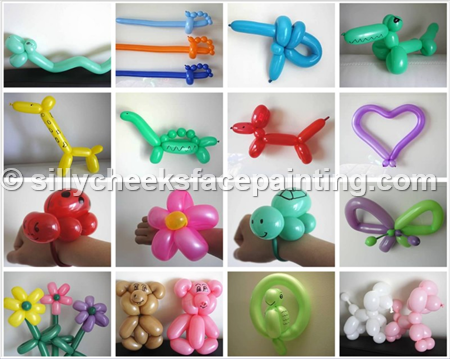 To top it off, Silly Cheeks pre-made some fancy balloons, such as, princesses, hello kitty wands, and spidermen. All the kids loved it! I first seen their work at my sisters event and I was amazed. I knew I had to book with them for my daughters first birthday as well. I had Stacy doing my event. She did not let me down, her work was fantastic. Everyone loved it, and she was a pleasure to work with. Wonderful, talented, professional and worth every penny! Perla arrived early to set up her work area and meticulously arranged her supplies while the kids gathered to look at images to choose from and she handled it all with ease. When she didn't have a child at her station she stayed busy making balloon figures to hand out. Several parents were extremely complimentary about how nice and sweet she was with the children. Her work itself was fabulous and her supplies were organized and clean. The children were both boys and girl ranging in age from 2 to 12 and there was something for everyone to enjoy. Even a couple of the parents got face painting or tattoos. Do not hesitate to book Perla. We had a wonderful experience with Silly Cheeks and Perla. The quality of the paint was exceptional and the details that went into the artistry was spectacular. One of our parents went to a play date soon after our birthday party and the other parents were so impressed by Perla's work they wanted to get information on Silly Cheeks for their future celebrations. Even adults were impressed by the balloon creations that some of them took them home as souvenirs. Thank you for making Joshua's birthday celebration a special one, Perla! Stacy came and did face painting and balloon twisting for my daughter's birthday party, and she was great! She arrived early, was very organized, tidy and good with the children. From the time I contacted her, she was very polite and communication was great. Everyone told me that she was the best face painter that they have ever seen, and I agree. I hope to use Silly Cheeks again in the future. Thank you! Fun, accommodating, and delightfully artistic! I just had my daughter's 1st birthday party and decided what the heck lets try Silly cheeks. Stacy from Silly Cheeks came on time before the party to setup. I had a lot of kids, family members and even adults who had lots of fun thanks to Stacy's beautiful craftsmanship! Kids with face painting refused to have them washed off even when they got home. Children as well as adults were all carrying balloon art out still playing with them while in the parking lot of my venue. It was fantastic! I would recommend Silly Cheeks to anyone have any sort of party to add an fun, economical as well as unique element as a host! Wonderful experience using Silly Cheeks for party! We use Silly Cheeks for my sons 1st Birthday Party and were very happy with the experience! Perla showed up on time, was very friendly and patient with the children ranging from ages 1-10. She did glitter tattoos and balloon twisting both were a big hit! I would absolutely book Silly Cheeks again and highly recommend their services! Perfect for children's parties! Perla was absolutely fantastic with the kids and parents as well! The kids had a great time. Even though it was time for Perla to leave, she stayed to face paint one more child, just so that he would not be disappointed. We are very happy to have Perla be part of my daughter's birthday. Thank you Perla! Stacy did an outstanding job at my daughter's first birthday party. Her services catered every age group and demographic at the party. Communication was flawless, and services were rendered just as promised. Although the fee was more than what I wanted to pay, it was well worth every cent. I would definitely and highly recommend silly cheeks for any party. Had the pleasure of working with Perla for my daughter's first birthday party. She was amazing with all the kids and everyone loved the work she did. We look forward to working with them again. We were very happy and satisfied with Perla's work. True artist if i may add. I sure do recommend her service to any party that you may have. We had a large event with over 500 children. Silly Cheeks (Perla) showed up at our event with a smile and ready to go! The kids loved her and she did a great job of making fun balloon shapes, and quickly! At the end of her time, we still had several people in line for a balloon shape, and instead of closing up shop, she made a balloon for every person in line. She went above and beyond! She was friendly and warm with all the kids, and very professional!! I would highly recommend Silly Cheeks, and will certainly be using them again!! I had Perla for my sons 2nd birthday. She was absolutely amazing. Shes extremely talented and so nice. She was on time and worked quickly. Everyone at the party enjoyed her, even the adults! The face painting was some of the best I have ever seen. She made the party a huge hit and I would recommend her for any party, gathering, or event....even adult parties! I look forward to having her at another event! Stacy came to my son's 4th birthday party yesterday and did a great job. The children were delighted with the face-painting and chuffed with their balloons! My son was a minion and got a sword balloon. My friend's daughter was a butterfly and got a lovely pink and yellow balloon bracelet. Stacy is very talented! Book her! It is so easy to recommend Silly Cheeks. We had a first birthday party and Stacy did balloon art and face painting. Awesome face paint and balloon art selection and skill. The kids and adults enjoyed her very much! Stacy is very professional, charming and creative! We loved having Silly Cheeks for my daughters Baptism! We hired Silly Cheeks to do both face painting/balloon twisting. Both were absolutely great!! The kids were super engaged! Perla was so patient and sweet with all the children at all times, which I am sure was probably hard at times. We definitely will use them again for our future parties! Thank you so much Perla! Perla did a 6 hour event for our grand opening event. Many parents told me that Perla was the best face painter they had ever seen! Her work was incredible and she worked non-stop the entire 6 hours, and her quality towards the end of our event was just as nop notch as the first piece she did. She also did balloon twisting, and those were just a amazing. If you're looking for the best, you just found her! She was also great with the kids, and worked quite fast. I would book with them again! I hired Silly Cheeks for my son 1st bday. I had 9 banquet tables, 28 children. I worked with Perla for this party. She was nice, professional, and very talented. All my quests where amazed by her skills and gave me tons of compliments for hiring her. I have been to a dozen kids bday partys with face painters / balloon artist. Perla's work was the best I have ever seen. She also works very well with children and their price are reasonable. Their pictures of their work should say it all. Silly Cheeks was a hit! Stacy did face painting and balloon animals at my son's 4th birthday party. She arrived on time and setup quickly. Stacy did an amazing job on the face painting! Everyone was impressed and asking where I found her. I highly recommend their services! You won't be disappointed! Absolutely AWESOME Company and TERRIFIC job!! I hired Silly Cheeks to work at a very high-profile event in Times Square on New Year's Eve. The customer and management reviews Silly Cheeks received were EXCELLENT!!! My venue manager was absolutely RAVING about the great job Stacy and her assistant did. The children and adults loved them. Even the venue staff got their faces painted! The designs were intricate and imaginative. From a business perspective Stacy Chen is really on top of her game. Very professional, courteous and dependable. Incredibly professional and AMAZING face painting! I hired Silly Cheeks Face Painting for my company holiday party. They were very professional and did an outstanding job managing a very large crowd of overeager kids! In addition, their designs were outstanding and I heard at least 3 people say that it was the best face painting they'd ever seen. I would agree! From start to finish, they were easy to work with. I will most definitely be using them again! Perla was our artist, she was very punctual, professional and set up all her stuff on a very organized fashion, She kept the girls at the party very curious and entertained , also she was incredibly creative with her balloons. Excellent artist and talent !!!! Stacy did a great job with my son's birthday party. She provided a prompt reply to my request for a quote and was equally responsive with all subsequent communications. On the day of the event, she was on time and professional, and did a great job with both face painting and balloon twisting. The kids loved it all. I highly recommended Silly cheeks!! I have work with them a lot of times and I decided to higher Perla for my Nephews b-day. Everybody lover her. She is artistic, fun, always on time and very easy to deal with. We had the pleasure of having Stacy work with us for our son's birthday party. She arrived early and stayed late. She was wonderful with the kids and every person there commented on how wonderful she was and how talented she was. Her face painting was exquisite - so beautiful and her balloon creations were great. I would highly recommend her!!! You get what you pay for.. and it was worth it! I've contracted Perla for Face Painting and Balloon twisting for my niece's Birthday Party. The quality of the work was stunning!! Perla was very reasonable and flexible, the kids loved it and the adults had a blast as well. Highly recommended! Daniel & I would like to thank Perla so much for coming to our daughter first birthday party. She did a awesome job painting on kids & adults face & arm. Every one was telling me what an amazing job she did. She got to the party early which it's always great news when your having a party, one less thing to worry about. She's very nice & her personally is great with kids & adults. I will hire her again in a heartbeat! That's how good & responsible she is! Once again, THANK YOU so much Perla!!! You did a great job!!! I cannot say enough great things about Silly Cheeks Face Painting! The two ladies that came to my offices for our Annual Halloween event were not only extremely personable, but extremely professional and SUPER speedy! In an hour and a half, they were able to paint over 35 faces ( and when I tell you I was blown away by how ornate and detailed their designs were? I mean it!) I cannot wait to bring them back and use their sevices again. They are simp.ly the best, and they will not dissapoint you. SILLY CHEEKS, for the win!! I must admit that I was throwing quite a curveball to Silly Cheeks - they came to work their magic on adults rather than children, it was late at night, and Perla ended up being on camera for a public access television show that I was working on. But even with those difficulties, Perla was a consummate professional and did an absolutely amazing job! Everyone was SO impressed with her work - she made everyone incredibly happy. I highly recommend Silly Cheeks for all your face painting needs! Two thumbs way up high for Silly Cheeks! Thank you! The artist is amazingly talented, courteous and worked well with all the kids. Truly amazing face paintings with lots of attention to detail! Thank you for helping to make our little one's birthday celebration a joyous and memorable one for the ages! At our Event the folks were so pleased to have their son or daughter get a creative face. I looked at mostly all face painted kids with such fascination, it was excellent creative work. Perla is the best face painter & balloon twister we've met! I hired Perla for my daughter's 1st birthday party and she was one of the highlights of the party. Everybody loved her face paint, from kids to adults! Very nice and friendly and very talented! A lot of people are asking about her, even after the party. Will surely hire her again! Thanks so much! No word can describe what a phenomenal job Perla did in my son's 1st birthday party. I hired Perla for both face paining and ballon twisting. She was very entertaining and had lots of patience with kids. All the kids went wild as soon as they saw what a beautiful job she did on the first face painting. They loved her! I have tried many face painters and no one is nearly as good, professional and loving as Perla. She definitely gave every single kid a memorable experience. Highly recommended and I will hire her again for my older son's birthday in December. Stacy was great to work with. The kids loved her and the face-painting was gorgeous. She is a true artist. I would absolutely not hesitate to hire her again for any of my client's needs. Perla did a great job at my daughter's BDay party. Her Elmo balloons were a huge hit. She was reliable, on time and professional. Stacy was the face painter/ balloon twister for my sons 3rd birthday. There were so many happy toddlers and Stacy had such a calm demeanor that the children were calm and patient when getting their 'art'. I would definitely hire them again. She was the highlight of the party. Cute and delightful for the kids, adults too! For a family fun day at the park we were recommended by word of mouth to these sisters. My family was very glad to have contracted them. They did some great work with very cute balloon animals, face painting and temporary tattooing. They were very great at requests and kept all the kids super happy and engaged. Really good value, extremely professional and good artists to boot! I absolutely loved the job that silly cheeks did for my daughters 7th birthday! All the kids loved every minute that they were there. It was great to see all the smiles on their faces! I would def book them again for another party and recommend them to friends and family!! Amazing job!! Everybody loved it! We used Silly Cheeks for both our daughters recent birthdays (6years and 4 years old). The kids all loved it and the parents were amazed at the beautifully detailed face painting, it was really amazing. We highly recommend Silly Cheeks and hope to use them again soon. We hired Perla for our daughter's 5rd birthday party and let me tell you she was the highlight of the night. Everyone loved her work, her spirit, her kindness and the kids loved her so much that they were asking their parents "I want her to come to my next birthday party" The parents were asking me where did you find her? I was lucky enought to find her here and visited her company website. 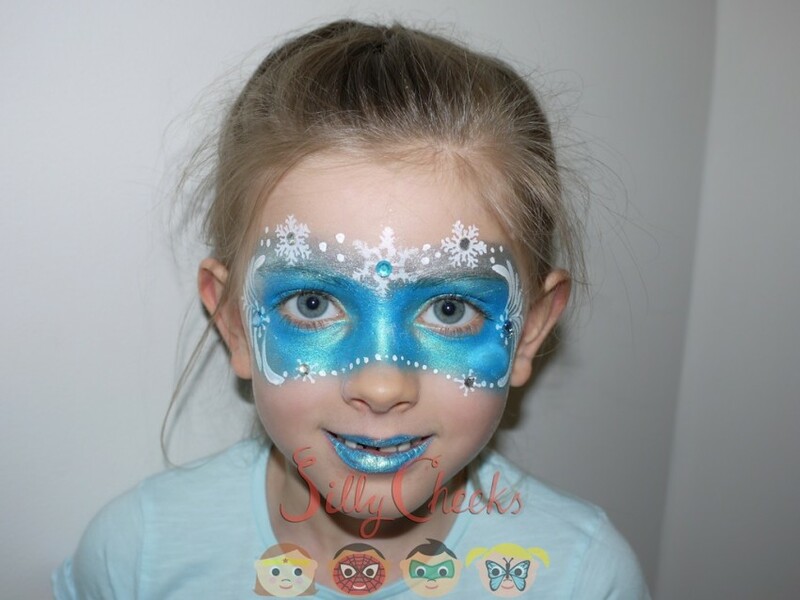 Silly Cheeks Face Painting had the best rate and the best reviews. Thank you Perla see you in a few months for Jacob's birthday. I recommend her to all my friends and families. I'm so happy I booked Silly Cheeks! Everything was great! Will definitely book for a next party! Always had a quick repose when an email was sent out! Overall great experience! Our guests were amazed by the artistry and creativity. Stacy was an absolute pleasure to work with and she did an awesome job at my event! We hosted a family alumni event in NYC and she worked off a custom menu, was 100% flexible, and adored by the kids and parents - and even a few kids in their 20s who had fun with it. I would absolutely hire Stacy again. I'm so happy I chose Silly Cheeks for the entertainment for my son's third birthday. Stacy arrived 15 minutes early to set-up. She was fast and efficient. The kids loved the face painting so much they didn't realize there was ballon twisting. When they did, Stacy was great about staying an additional 1/2 hour. I will definitely use her services again. Perla from Silly Cheeks was awesome! She did face painting and balloons for my son's first birthday this past weekend (August 10th). She was prompt, efficient, clean, extremely nice and of course wonderful facepainting and balloon art. She was also very patient with all of the children. I highly recommend her and hope to have her again. Perla, did a Fabulous Job and all the Kids enjoyed the Face Painting and Balloons!! I will definitly Give her Call for my next Party!! Amazing Talent and great with Kids! Silly Cheeks has worked with Queens Botanical Garden at several of our large events serving thousands of visitors. Their service is impeccable; they are fantastic with the public and their artwork is phenomenal. They take the time to make each child feel special! We love working with Silly Cheeks and highly recommend them! Silly Cheeks is not a silly business! We used Silly Cheeks at a school function. Everyone was thrilled with the quality of the work and the talent of the artist. It was a big hit. Highly recommended! Thanks Stacy and Perla you guys are awesome! The face painting were beautiful and everyone absolutely loved u two! We had such a big turn out at our fundraising event but you guys didn't break a sweat! Thanks for making our event such a success! Perla was awesome with the kids! Perla was super sweet with the shyer kids. She brought a few portfolios for everyone to choose from. She was a real artist so when some of the kids wanted sports logos it was a breeze for her to do. Ended up giving her card out to the moms at the party because everyone was sooo impressed. A definite for next year! It was my pleasure servicing your party and I'm glad everyone had a great including the big kids(adults). Perla was an ABSOLUTELY PLEASURE!!! My family are a lot to handle... In the best way of course :) She held her own perfectly with patience, professionalism and a great sense of humor. It was a 2 years old party and she was content with waiting for the children to fall asleep to paint their faces and they came out BEAUTIFULLY. The face painting was GORGEOUS and she even did some great balloon animals for some of the kids who came late. She arrived early and ready to work. I would not only use Perla and Silly Cheeks again but would recommend them to all my friends and family without hesitation. Had an amazing time and have a ton of great pictures and memories. THANK YOU AGAIN!!! Gabby,it was my pleasure servicing your party. Your family was awesome had a great time painting the kids and the big kids(adults). Thank you for having me at your daughter's birthday party. See you all soon!!! The best art work I have ever seen! I hired Perla for my daughter's 5th bday and I was totally amazed by her artwork! I have had many face painters for my kids past birthdays but her artwork was exceptional!! All of my guests are still complimenting me on her work. She was so nice and patient with the kids and all the guests loved her. Her rate was so good for the quality of work she did. I am so happy I booked her! Thanks again Perla! see u next year. Laura, thank you so much for having me at your daughter's 5th birthday party. See you next year!!! Insurance: We have full liability insurance. Copy available upon request. We provide beautiful fast face painting and the cutest balloon creations ever!! We don't just do your ordinary sword or balloon dog. We create balloons that will wow your guests, such as our popular Elmo, Spiderman and princess balloons!! All of our paint used are FDA Approved and cosmetic grade paint that is made specifically for use on the skin. We follow strict hygiene practices to ensure the safest painting experience for you and your guests. Depending on the complexity of the design, we can paint approximately 12 to 18 faces in one hour. Silly Cheeks was started by two sisters with a passion for arts and crafts. The company has grown into one of the best entertainment companies in NYC and NJ bringing exceptional high quality service with a focus on professionalism. It includes a team of the BEST face painters and balloon artists available for private parties and corporate events in New York City, Brooklyn, Queens, Long Island, New Jersey and Connecticut. All of our artists have completed specific training in their profession and are ready to bring some unforgettable moments to your event. Silly Cheeks was recently named as one of Ten Fantastic Face Painters in Mommy Poppins! You won't be disappointed with Silly Cheeks and their team of talented artists! Perla is a passionate and talented visionary who loves to draw, paint, sculpt, sew, fold origami, and create beauty with makeup. I know that’s a lot of arts and crafts! But being artistic was in her DNA. Both of her parents were exquisite seamstresses that ran their own boutique for custom designs. Perla was always intrigued by the different colors and patterns of fabrics and the beautiful pieces of garments that became of them. In college she attended various art courses and still continues to dedicate her time to learn and experiment with unique and cool designs. It was not until she became a mother that she discovered the joy of painting on a canvas that would smile back at you. It was her daughter that inspired her when she excitedly said: “Mommy I want to be Hello Kitty for Halloween” Perla being the artistic mommy bought face painting and made her into an adorable Kitty. From then on she started painting her children’s faces (and hubby’s too) on a daily basis. Face painting has now become such a huge part of her that she literally dreams in colors. It has allowed her to take her creativity to the next level while fulfilling every child’s imagination. Stacy has been a lover of the arts before she was even potty trained. As a little girl, she would doodle on the walls of her family home and get herself into plenty of trouble. When she started school, art class was always her favorite class, whether it was coloring with crayolas, drawing little animals or sharing her artwork for the school yearbook. Her passion for the arts and photography came naturally, however, she doubted she could make a career out of it and didn’t want to become a part of the starving artists club. She went on to obtain a Masters Degree in Public Health and established a career as a public health educator while keeping her love for the arts as a hobby on the side. When she became a mother, she took leave from her career and had more time to dedicate her love for the arts. She loved being a mommy and wanted to work with children and thats how face painting came in the picture. She started taking face painting classes and started painting on her family, friends and everyone she knew. She has been face painting ever since and loves every part of it, but the biggest reward is when she sees those big smiles on the little kids faces when they see their faces being transformed by her artwork. Art is not only a painting hanging on a wall in a gallery, but alive and a wonder for all to enjoy like in face painting. A 2x3 table and 2 chairs is all we need to set up!